We beat the land grabbers three times; help us make it four. need help again to go another round. The stakes are enormous for our middle-class community and for many other communities that benefit from land-use protections. Save the Lakes is a group of homeowners, many of whom are retirees, living in a city-community of 100,000+ people called Ahwatukee in the greater Phoenix area. We have confounded everyone’s expectations by stopping real estate speculators – not once, not twice, but three times so far. Here is our story in a nutshell. Developers, led by Pasadena, CA investor Wilson Gee, have wanted to turn a large open space and golf course that has been legally protected from development for over 40 years into a housing development. The 18-hole Ahwatukee Lakes Golf Course was once rated among the top 10 executive courses in the nation. Development efforts began in 2008, when these “investors” and developers wanted to take a community resource and resell it at an enormous profit for housing. In exchange, we were to be “rewarded” with traffic jams, flood risk, and lower quality of life. We didn’t think that was a fair deal. First, the developers claimed that a deed restriction on the property really didn’t require a golf course on the property. We went to court and the judge ruled in 2016 that the deed restriction really does require a golf course on the property. The judge also ruled that if the developers wanted to use the property for another purpose, they had to follow the procedure outlined in the deed restrictions. ( https://savethelakesahwatukee.org/judge-ruling-july-11-2016/.) Given the court’s ruling, the developers began a multi-million dollar public relations and advertising campaign to persuade homeowners to agree to change the deed restriction. For the second win, we fought back against their campaign of misleading information, glitzy artist renderings, and boosterish propaganda. We held community meetings, met with neighborhood groups, wrote op-ed pieces. We even ran a few ads, but not nearly as many as the developers. Despite outspending local homeowners on a magnitude of nearly 20:1, the developers’ campaign failed to collect enough signatures. Failing to get enough signatures, the developers then asked the same judge to overturn the deed restriction based upon a notion that “material conditions” no longer justified keeping the open space as a golf course. After a costly trial, the judge delivered the developers’ third defeat. Maricopa County Superior Court Judge John Hannah declined to overturn the deed restriction. Instead, he concluded that the developers acted in bad faith and violated the deed restriction by not operating a golf course on the property and ordered them in May 2018 to restore the course. He also awarded us attorney’s fees, which the developers have not paid. ( https://savethelakesahwatukee.org/judge_rejects-true-life-bid-to-change-ccrs-jan-2-2018-legal-rulings-latest-ruling-and-findings/) They also have not begun to restore the golf course, for which we will be seeking a contempt of court citation. But rather than listening to the resounding “No” from our community, the developers have returned. They are now asking the Arizona Appeals Court to overturn the lower court and let them build as many homes as they can get permission to build. 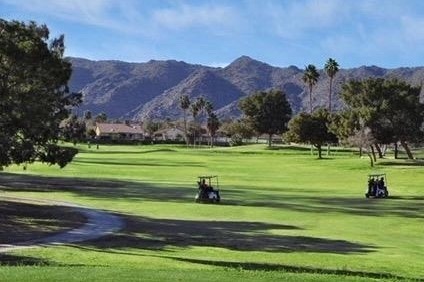 The developers and their investment partnerships have very deep pockets and have spent millions so far trying to develop Ahwatukee Lakes Golf Course, and they are willing to spend more in hopes of a multi-million dollar payoff. The stakes in the case are huge, not just for homeowners near this course and the surrounding neighborhoods. The repercussions could go beyond the parcels in the Ahwatukee Lakes Golf Course. If the Appeals Court decides that the developers may build on the Lakes course, the deed restriction on the Ahwatukee Country Club Course could also be unilaterally changed by the developer and more houses built. Moreover, since the case is now in the court of appeals, it will likely become ruling legal precedent for similar open spaces, not only here in Arizona, but nationally since there are few cases that have previously been decided on the legal issues presented. When our community was designed, the land in the golf course was left undeveloped to allow floodwaters to collect and gradually abate. Now, the developers imagine that the rains will no longer fall. All of this building is literally at the central hub of our town, where the streets and other infrastructure were designed for considerably lower housing density. Based on previous court rulings and the law, we believe we have solid case and we are confident that the appeals court will reject their appeal. Nevertheless, having our say in court is expensive. We need to raise $15,000 to pay our attorney Tim Barnes for his work on the appeal. We are not asking others to solve our problems; we have a realistic plan and we are willing to work to follow it through with it. But we desperately and sincerely need your financial assistance to make it happen. Help us deliver the fourth strike. Come and hear about the future of Ahwatukee, golf, and Ahwatukee Lakes Golf Course at the Lakes Golf Course town hall meeting. Spoiler alert: Golf is not dead, as Wilson Gee and The True Life Cos. would have you believe. The town hall meeting is at 10 a.m. Saturday, March 9 at the Ahwatukee Recreation Center, 5001 E Cheyenne Drive. This is your chance to get the other side of the story about golf and Ahwatukee Lakes. The experts will make brief presentations and answer questions from the audience. These persons are scheduled to attend. Tim Barnes is attorney for Linda Swain and Eileen Breslin, who can discuss recent court rulings in our favor, the appeal, and pending efforts to hold the golf course owners in contempt for failing to begin course restoration. Wayne Smith was the land planner for many of the planned developments in Ahwatukee. He designed the Presley developments in Ahwatukee, Mountain Park Ranch, and the Foothills. He will discuss why land was set aside for golf courses when Ahwatukee was designed and why removing them would be a bad idea. He also designed the Indian Bend Greenbelt, a park in Scottsdale that controls flooding in much the way the Lakes golf course was intended. Buddie Johnson is a golf course appraiser and developer of Las Sendas who testified as an expert witness about the feasibility of restoring Ahwatukee Lakes Golf Course in the court case. Johnson believes that Ahwatukee Lakes could be a profitable course with an appropriate owner. He has been approached by several potential owner/operators for the course. Two managers of golf courses similar to Ahwatukee Lakes will discuss how they kept their courses open during the economic and golf participation downturn. RJ Hawley of Millenium Golf was manager of Tempe Municipal Golf Courses. Don Rea is a director of the PGA of America and a director of the National Golf Course Owners Association. He is owner/operator of Augusta Ranch Golf Course in Mesa, an executive course. Rea is also owner/operator of Community Course Rescue Services, a business that helps golf courses get and stay profitable. Gary Brawley, ASGCA, is a golf course architect who once worked for Gary Panks, the original architect for Ahwatukee Lakes GC. Brawley designed the Cattail course at Whirlaway GC south of Ahwatukee. He will talk about what’s involved in renovating a golf course and how a new design can reduce water consumption by 40 percent. Hawley, Rea, and Johnson can discuss the outlook for golf in general and executive golf courses in particular. Jeffery Hall, the president of the Save the Lakes organization, will moderate the discussion. If you have questions for the panelists, save time by submitting your question in advance to info@SaveTheLakesAhwatukee.org. A brief business meeting for members of Save The Lakes will follow the Q&A.